April showers bring… Well, we know the end of the saying is May flowers, but in this case, we don’t want April to end! This month, we’ve seen a showering of amazing designs and fabulous inspiration, and we are beyond excited to share some of our favorites with you. Please vote below for the one you love most; we’ll send the winner a $50 Visa gift certificate, courtesy of Project Nursery. 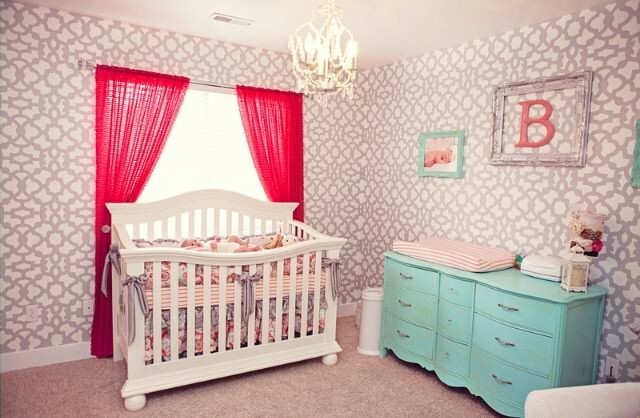 Sabrina, of Project Nursery, says, “This nursery is elegant and captures eclectic, feminine design elements of Wyoming, the rustic state from which it was inspired. Those moose antlers from Jackson add a great touch as does that cozy cowhide rug. Now it’s up to you to tell us which room is your favorite! Vote below, and comment if you can because we’d love to hear why your pick got your vote. Voting ends on April 30th at 11:55pm PST, and the winners of best room and party will be revealed on May 1st. Winners will receive a $50 Visa gift card from Project Nursery. Good luck!